At 3:00am the doctor came in and said we needed to do a c-section before the situation became drastically worse and a threat to the baby. I had read up about placental abruption during my pregnancy and knew the danger it posed to both of us. In the next 15 minutes several doctors came with what seemed like an overload of information to process in such a short time. Everything from the anesthesiologist telling me I would be put completely under and Aaron couldn’t be in the room with me, to the neonatalogist saying our baby would be in the NICU for six weeks. Overwhelmed with information all I could say was I wanted my little girl baptized. Everything happened so fast that I didn’t even have time to react emotionally as I said goodbye to Aaron and was wheeled off to the operating room. As I was placed on the operating table too many doctors and nurses to count filled in around me and I could feel my anxiety rise. They were doing all of the prep work while I was awake and as quickly as possible so they could get Grace out before anesthesia would cross the placenta. At that moment I was paralyzed with fear. With each breath I continually said, Jesus I trust in you…Jesus I trust in you…Jesus I trust in you. The entire procedure went very fast as they had Grace out in 15 minutes and I was out of the operating room in 30. Aaron was able to reach in for a moment and touch Grace’s little body as they wheeled her through the hall to the NICU. When I awoke I was back in my room with Aaron by my side showing me pictures of Grace. It all seemed like a dream and looking at the pictures I couldn’t believe that she was really ours and that she was here. I lost track of all time at this point, but what seemed like shortly after I woke up the nurses wheeled my bed to the NICU to meet Grace for the first time. As they wheeled me in I saw her tiny body connected with so many tubes and cords. My eyes instantly filled with tears seeing her for the first time. So many mixed emotions filled my heart. Joy for this precious new life yet overcome with guilt. Lying by herself all I wanted to do was pick her up and have her in my arms when all I was able to do is reach out and touch her leg. I wanted to be her mama, embrace her, hold her and make all of the pain she was experiencing go away. The first meeting with her was all too brief as they wheeled me back to my room to fully recover. I tried my best to rest and get some sleep, but all I could think about was her. As soon as I felt somewhat coherent I forced myself to get out of bed, so Aaron could wheel me down to the NICU to spend more time with our little Grace. 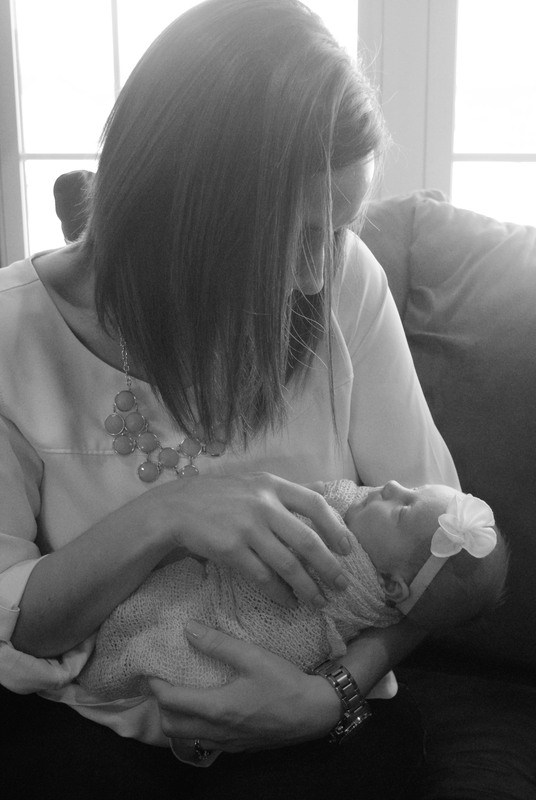 This time I was able to hold her against my chest and just sit as long as I had liked snuggling our little miracle. The next nine days were extremely difficult as we anxiously waited for Grace to get discharged from the NICU. They were filled with a lot of prayer, love, stress and exhaustion as I divided my days between being at home with the boys and at the NICU with Grace. Yet I am so incredibly grateful it was only nine days! She wasn’t expected at 34 weeks, but more than welcomed! Truly blessing our family with a new love and a new joy!!! Thank you Jesus!! !